The come alog clamps are specially used for gripping stranded earth wires. 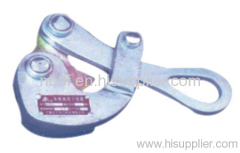 The jaw of clamp is specially designed for holding the earth wire firmly. Group of Come Along Clamps for Earth Wire has been presented above, want more	Come Along Clamps for Earth Wire and Wire Grips for Earth Wire, Please Contact Us.